Last week I grabbed a copy of the New York Times and found a front page article with this headline: “Cigarette Company Paid for Lung Cancer Study.” The story, and its front page placement in a publication that is generally considered America’s newspaper of record, is a perfect example of the double standard and bias of the news and science of smoking. Here’s the short version of the article (which can be read in its entirety here): A study finds that lung cancer can be significantly reduced through early CT scans but, since the study was funded indirectly by a cigarette company, its results may be tainted. Why a study funded in part by tobacco companies automatically taints the results is not exactly clear. Instead of criticizing the methodology of the study or suggesting that the results are not scientifically supported, critics let loose a series of ad hominem attacks. Which brings me to the anti-smoking bias: There is a clear double-standard when it comes to assuming that tobacco company-funded research is automatically biased and illegitimate, while research done or funded by government and anti-smoking activists are assumed to be noble and on the up-and-up. As the article admits, so-called “cancer advocates and researchers” so viciously hate tobacco companies that any association with one is grounds for expulsion from the scientific discussion. What could be more biased than that? And yet the research produced by these same scientists and activists is used to justify smoking bans, tobacco taxes, increased tobacco regulations, and other anti-smoking laws. Why is it not considered biased when a group of scientists who hate an entire industry always seem to come up with research that supports restricting that industry’s product? Further, funding for anti-tobacco organizations like the American Cancer Society and other groups comes from two sources: government agencies and individual and foundation donations. (Additionally, some groups like the ACS are considered by many to be in the pocket of the pharmaceutical industry.) To suggest that these funding sources are any less prejudiced would be a dubious assertion. People and foundations that fund anti-smoking groups and researchers know that the studies being conducted are looking for reasons to ban and regulate tobacco, and they support that goal. Meanwhile, government bureaucrats have power to gain if they can further tax and regulate tobacco, not to mention jobs to loose if the research they fund or conduct doesn’t support more regulations or conducting further anti-smoking studies. Ultimately, there is always going to be some bias on science when it is funded by people with an agenda, and my purpose here isn’t to defend the tobacco industry who surely has its share of faults. But hyper-sensitivity to the influence of tobacco companies is leading to a blindness of the pervasive anti-smoking bias that undoubtedly affects the research and conclusions of what can fairly be called the anti-smoking industry. Just don’t hold your breath waiting for the front page story in the New York Times about that bias. Patrick – I hope our friends in the cigar industry see and learn the absolute shameless behavior of the anti-tobacco lobby. SCHIP will be back in the new Congress and worse than before even if Republicans retain the White House. We need to hammer home to all Members that "small business"/"mom and pop" are the real losers if taxes destroy the cigar industry. 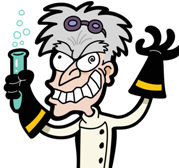 Apropos of nothing, I just want to add that that mad scientist picture is hilarious. It's all very similar to the argument that environmentalists make against studies showing that global warming is either not as bad as they say or that it is not manmade–they accuse the studies of being funded by "big oil." As if they had no agenda themselves and their motives as as pure as the wind-drive snow. I fear the next 4 or more years will be very expensive for anyone who smokes (cigars, pipes, or those "evil" cigarettes) as well as for all of us who would like to drive a bigger and safer vehicle. With the candidates running for office, I see no way that SCHIP isn't passed and enviros aren't pandered to.